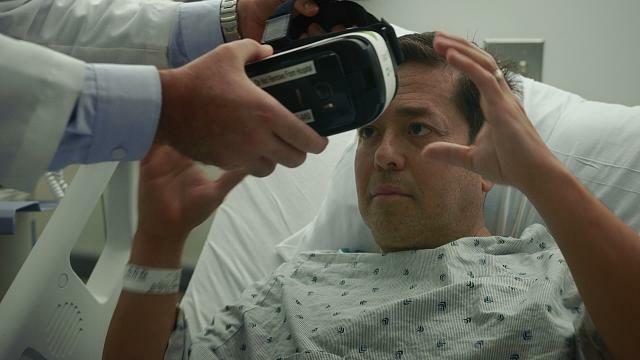 With the price of hardware falling, VR equipment has become a more affordable option for doctors. When Deona Duke woke up from a medically-induced coma to begin recovering from burns that covered almost a third of her body, one of her treatments was hurling snowballs at penguins. The 13-year-old was set on fire when a bonfire exploded on her and her friend. To prevent infection, burn victims need their bandages changed and dead skin scraped away. Sometimes, even morphine isn’t enough to make that tolerable. At the Shriners Hospital for Children in Galveston, Duke’s doctors gave her a virtual reality headset. Slipping it on, she was immersed in “SnowWorld,” an icy landscape where she got to lob snow at snowmen and igloos. 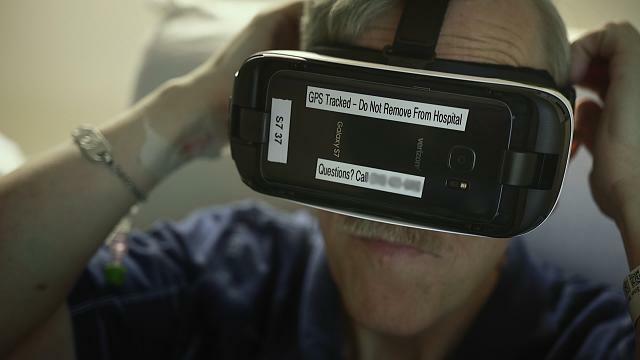 The Texas hospital is one of the few trying out virtual reality to relieve pain. It’s still a new and experimental approach, but proponents of virtual reality say that it can be an effective treatment for everything from intense pain to Alzheimer’s disease to arachnophobia to depression. And as Facebook Inc., Sony Corp., HTC Corp. and others race to build a dominant VR set, the price of hardware has fallen, making the equipment a more affordable option for hospitals looking for alternatives for pain relief. The idea is that the worst pain can be alleviated by manipulating the way the human mind works: the more you focus on pain, the worse it feels. Swamp the brain with an overload of sensory inputs—such as with the immersion in a virtual world—and its capacity to process pain, to be conscious of it, goes down. In research done at Shriners by psychologists Hunter Hoffman and Walter Meyer, and similar work done by Dave Patterson at Harborview Burn Center in Seattle, patients reported less discomfort. Hoffman examined magnetic resonance imaging (MRI) scans of patients’ brains, which showed they actually experienced less pain. At Cedars-Sinai in Los Angeles, Ronald Yarbrough is waiting in a room that overlooks the hospital’s landing pad, hoping to see helicopter bring him a donor heart. He needs a transplant after his artificial one failed and is being kept alive by a machine. He has been trying a Samsung Gear VR headset and specially created software from a startup called AppliedVR. It helped take his mind off the fact that he’s confined to a small hospital room that can feel like a jail cell. When his muscles relaxed, his pain receded, he said. Proponents of VR are quick to point out that it could have a big benefit over drugs, which can lead to tolerance over prolonged use and sometimes addiction. But VR’s effectiveness still has to be proven, particularly when trying to combat chronic pain. Does the effect last when the headset comes off? There’s a lot more research needed before VR is going to be widely accepted as a pain relief method. Brennan Spiegel, a gastroenterologist at Cedars-Sinai who’s also director of health services research at the Los Angeles hospital, is about to begin a study on many more patients. So far he’s experienced a range of reactions. Older patients tend to be less open to it than younger ones. One terminal patient refused to even consider it. One woman, who suffered abdominal pain, got such immediate relief that she went home and bought herself a headset. The price of a headset and software is tiny compared to the expense of keeping a patient in the hospital for an extra day. VR’s potential for use in pain management was discovered by accident. Tom Furness is a professor of industrial engineering at the University of Washington and considered to be the godfather of VR by his peers. He started looking into VR 50 years ago when he was in the Air Force, and has spun off more than 20 research projects into companies. One of them was a 1993 consumer headset that relied on a TV tuner and video tapes that sold for $799. It was a commercial flop because of the limited content, but a lot of dentists bought it. “The dentists loved it because their patients weren’t complaining,” he said. The experience distracted children from their fear of injections, drilling and fillings. That aha moment led to more research into the long-known phenomena of distraction and meditation as techniques to relieve pain. But just like Furness’ attempt to bring VR to the masses, it was held up by costs. Early VR equipment for medical use cost as much as $35,000 for a headset, said Hunter Hoffman, who studied with Furness at the University of Washington. That’s all set to change this year. VR is graduating from geeky sideshow to big business and equipment prices are dropping. Oculus Rift Headset retails at $599. HTC’s Vive costs $799. To get them to work, you’ll need a PC that costs about $999 to run the software. The market’s going to continue to expand as Sony adds the capability to their game consoles and smartphone makers upgrade their technology to get closer to the kind of performance needed to provide an effective VR experience. The economics may make VR an attractive experiment for some hospitals. Hospital care takes up to about 30 percent of the U.S.’s annual $3 trillion in health-care spending, making it the most costly category of treatment. The price of a headset and software is tiny compared to the expense of keeping a patient in the hospital for an extra day. 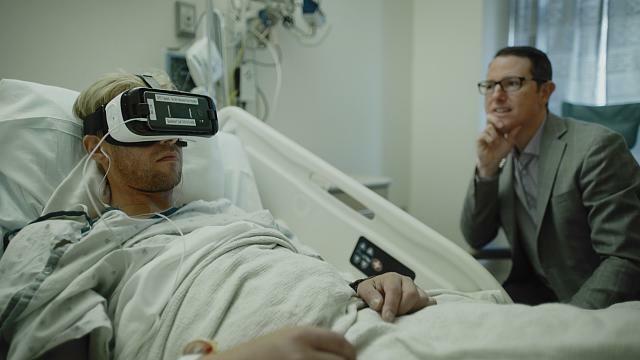 So if there’s a chance that VR could lead to an early discharge, it may make sense for a hospital to spend on the hardware, said Cedars-Sinai’s Spiegel. Companies such as AppliedVR are already trying to make the distribution and development of the technology into a business. They’re supplying hospitals with the headsets and therapeutic software. Another startup, DeepStream VR, is also working on software and systems that help patients with burns and other injuries. Its ‘Cool!’ software features the adventures of an otter. They may have some work to do to keep patients interested. The VR made her feel better, but Duke quickly got bored with SnowWorld, and that diminished the painkilling effect. I was recently diagnosed with fibromyalgia. If my pains become unbearable again hopefully VR might give me the occasional mental respite I need. OMG That is so interesting! I especially like reading about that little girl throwing the snowballs.